Washington put its tenacious 2-3 zone on display during the NCAA tournament. This is how it’s so effective. Two years ago, Mike Hopkins sat at a podium inside Alaska Airlines Arena in front of a crowd of strangers curious about the former Syracuse assistant. It took just a few minutes for the new Washington men’s basketball coach with the manic personality to endear himself to a room full of skeptics. Perhaps most intriguing was the coach’s description about his favorite weapon. The 2-3 zone has been a Huskies staple since Hopkins’ arrival and No. 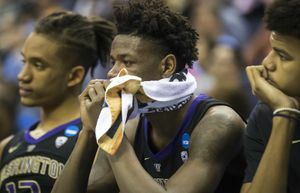 9 seed Washington used it to dismantle Utah State and force 21 turnovers in its 78-61 first-round win in the NCAA tournament. It’s taken the Huskies two years to get comfortable with the simple scheme that’s tormented and stifled opponents all season. Before Hopkins’ arrival, the Huskies allowed an average of 81.1 points per game, which ranked 330th in the country. This season, UW surrenders just 64.4 points — 2nd in the Pac-12 (behind Oregon) and 30th nationally. The Huskies have embraced their trademark defense, but it took some convincing. Truth be told, Jaylen Nowell never liked the zone before he met Hopkins. “Personally, I thought it was soft,” Washington’s sophomore star said smiling. “Coming from the Metro League (at Garfield High), nobody played defense like that. In high school, it was straight up man all the time. 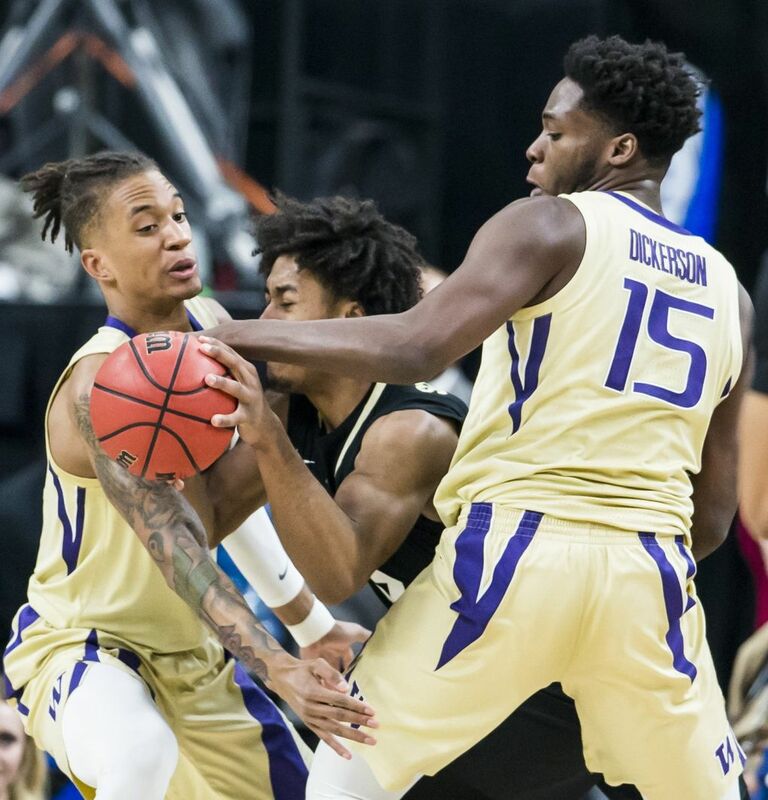 For years, UW senior forward Noah Dickerson wasn’t a fan of the zone and didn’t have a high opinion of teams that employed that style of defense against him. “I thought teams that played zone couldn’t guard,” he said. “In my mind, that’s why you played zone. In high school, if you went zone then that meant you couldn’t guard me. At the end of the day, that’s what it came down to. Even in college, I felt that way. And few teams do it as well as Washington. Hopkins was first introduced to the 2-3 zone during his five-year collegiate career at Syracuse as a guard. He then spent 22 years as an assistant under Hall-of-Fame coach Jim Boeheim, who practically invented the defense. 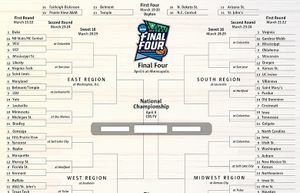 The basic principle of the UW’s zone requires players to defend a region on the floor rather than a particular player. 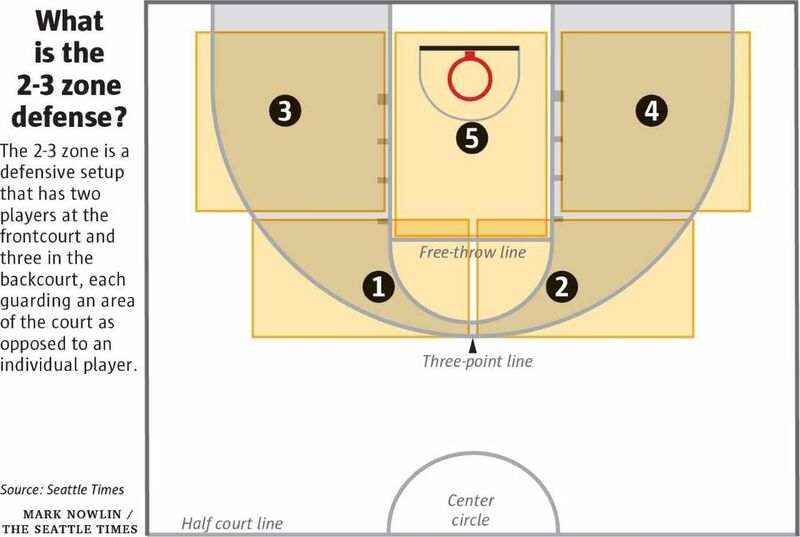 The “2” in the 2-3 zone refers to guards David Crisp and Matisse Thybulle, who are positioned on either side of the free throw line. Before each defensive possession, they reach out and slap hands as a sign of solidarity. The other three players form a back line spread between the sidelines with Dickerson and Nowell on the wings and 6-foot-9 sophomore forward Hameir Wright, UW’s tallest starter, planted in the middle to defend the rim. 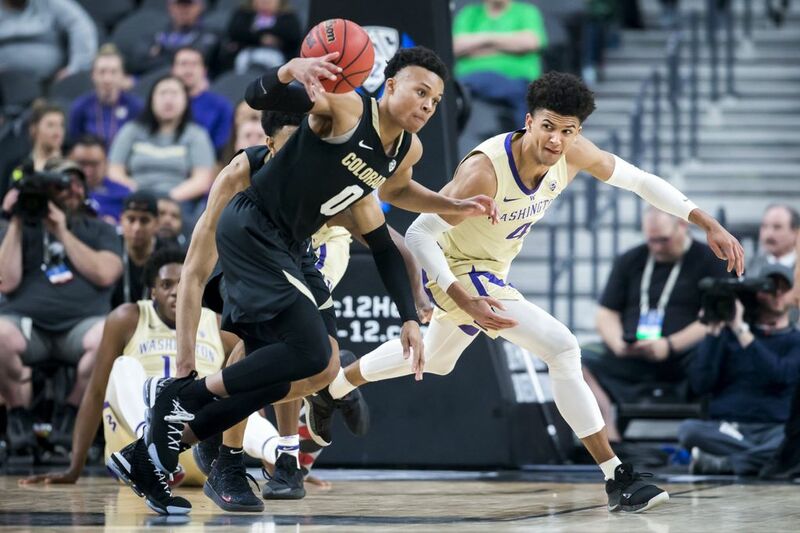 In theory, the zone defense is vulnerable against a proficient perimeter attack, but UW’s defense is designed to expand wider than most zones to negate the three-pointer. The Huskies ranked third in the Pac-12 in three-point defense, while allowing opponents to shoot 32.9 percent behind the arc. Due to its focus to take away outside shots, Washington has been susceptible inside to versatile players who can operate in the high post and dominant rebounding teams. The Huskies have been able to prevail despite big games from multi-dimensional players, but they’ve lost the rebound battle in 21 of 34 games. UW is outrebounded an average of 2.4 boards per game. “Where we sometimes get hurt is rebounding,” said Dickerson, who averages a team-high 7.4 rebounds. “You can’t have just have one person rebounding in the zone. Everybody has to rebound. 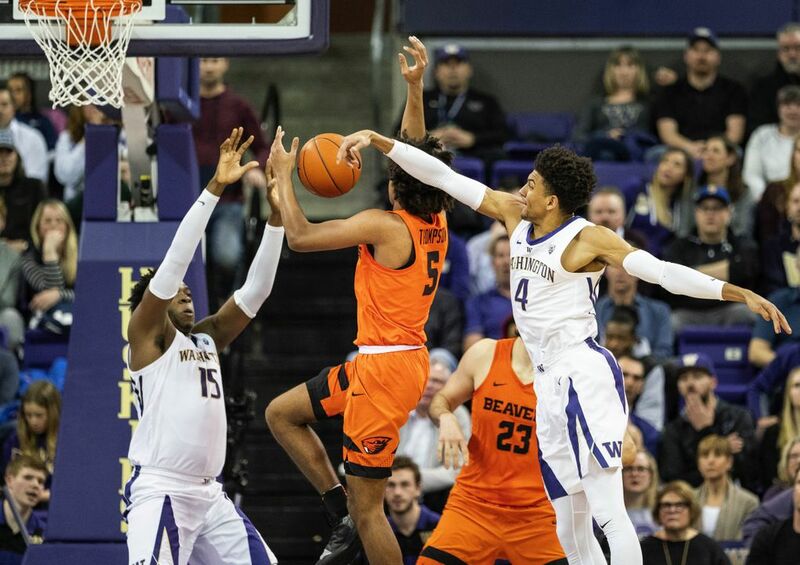 Of course, it helps to have Thybulle, the Pac-12’s two-time defensive player of the year and semifinalist for the Naismith national defensive player of the year award, on your side. 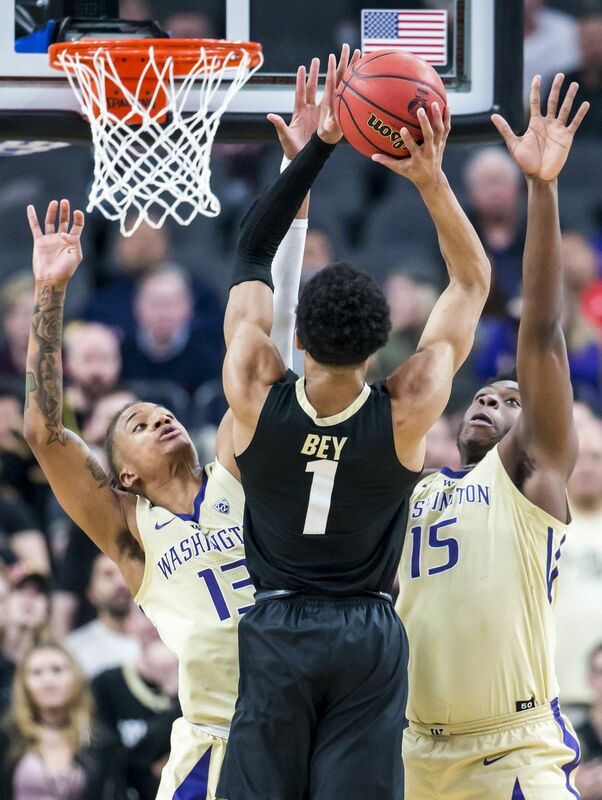 The 6-5 guard with a 7-foot wingspan started in the back of the zone early last season before UW assistants urged Hopkins to move him out front. 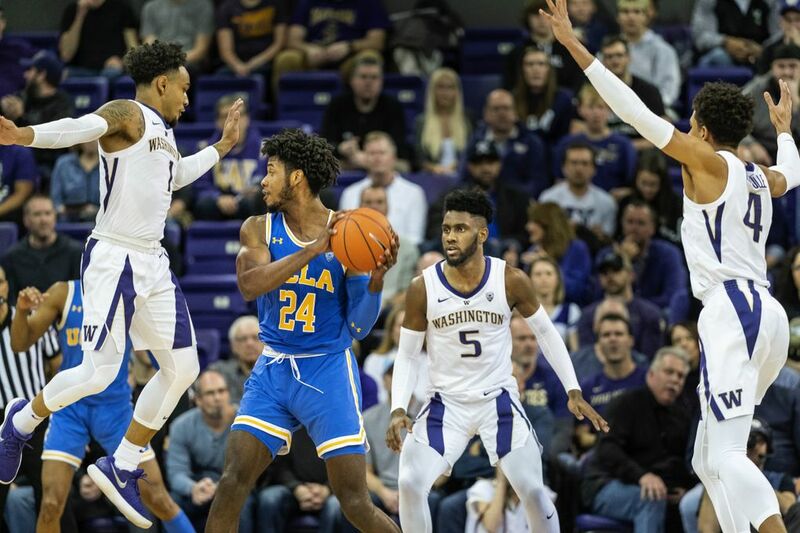 Thybulle, who just passed Gary Payton to become the conference’s all-time steals leader, tallied 101 thefts last season and set the league’s single-season record with 117 this season. During a radio interview Tuesday, Utah State coach Craig Smith joked he’s going to have the Aggies practice against seven or eight players with pool noodles to simulate Washington’s length and defensive prowess. “We’ve played 34 games now and there’s not much you haven’t seen up to this point,” Smith told KJR when asked how much zone USU has faced. “We have a feel for it. Obviously they do some things a lot better than most do. The Huskies are first in the Pac-12 and ninth nationally with 9.0 steals per game. They also forced 16.2 turnovers that ranks 18th among Division I schools. 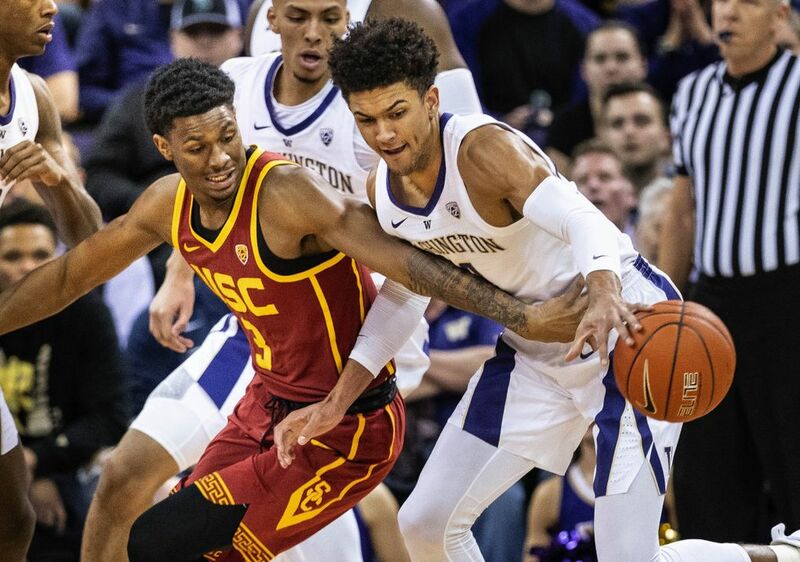 When Washington is at its best, it’s able to suffocate opponents the like it did during a 62-45 win over Utah or its 69-55 win against UCLA. Lately though, Hopkins has spotted what he called “slippage” in UW’s defense the past three weeks. 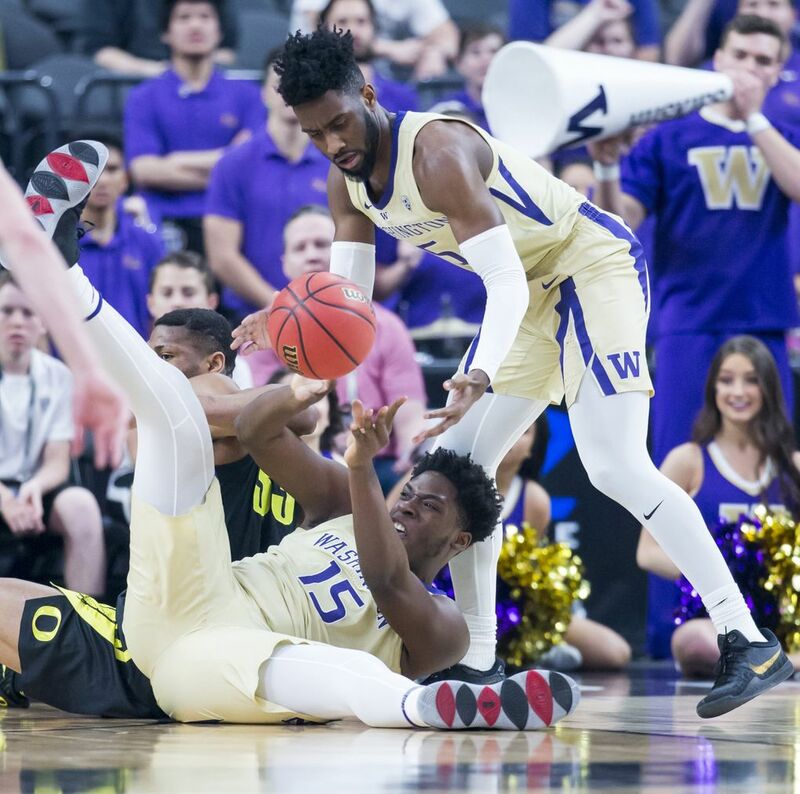 The Huskies have allowed at least 68 points in four of the past seven games, including a second-half defensive meltdown when Oregon scored 40 points and shot 64.4 percent to capture the Pac-12 Tournament title. While some believe Washington needs to fix its struggling offense, Hopkins is focused on fine tuning the defense. “At this stage, we’re not putting in a new offense so we’ve got to do what we do, only do it better,” he said. “We can still get better on defense.